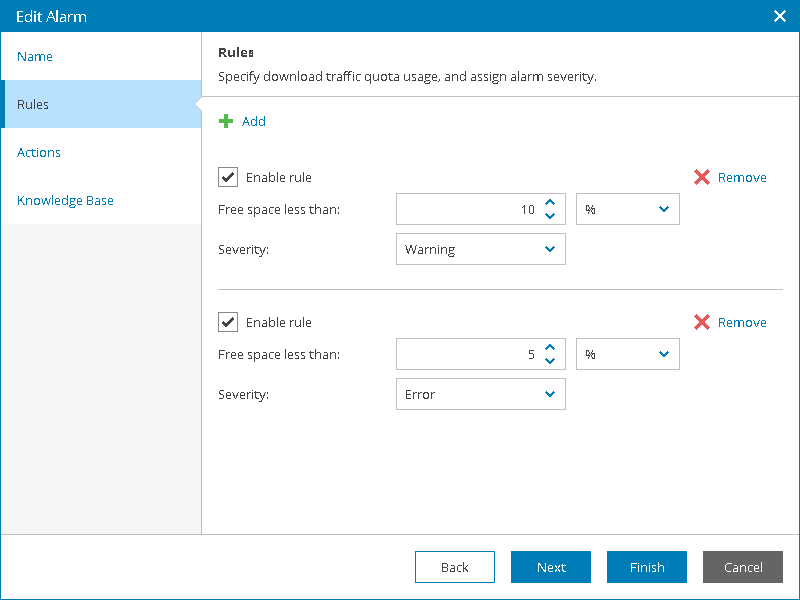 You can modify alarm rules and response actions in accordance with your requirements. To modify alarm settings, perform the following steps. In the configuration menu on the left, click Alarms Management. Select an alarm you want to modify. At the top of the list, click Edit. Alternatively, you can click a link in the Alarm Name column. Veeam Availability Console will launch the Edit Alarm wizard. At the Rules step of the wizard, specify conditions according to which the alarm must be triggered. Options available for alarm rules vary for different alarms. Depending on the alarm type, you may need to modify alarm thresholds, alarm tolerance, alarm severity and so on. (*) — a substitution for one or more characters in the object name or path. Can be used for any sequence of characters (including no characters). (?) — a substitution of one character in the object name or path. At the Actions step of the wizard, specify actions that must be performed when a new alarm is triggered, or when the status of an existing alarm changes. By default, all alarms are configured to send an email notification to Company Owner and Location Administrators and at the email address that is specified in global notification settings. Alarm notifications are sent each time when a new alarm is triggered, or when the status of an existing alarm changes. This response action is called Use global notification settings. You can modify the default alarm response action, or add new actions. At the top right corner of the wizard, click Add. In the Action field, choose Send email notification. In the Value field, type an email address at which a notification must be sent. Any state — select this option if a notification must be sent every time when the alarm status changes to Error, Warning or Info, or when a new alarm with one of these statuses is triggered. 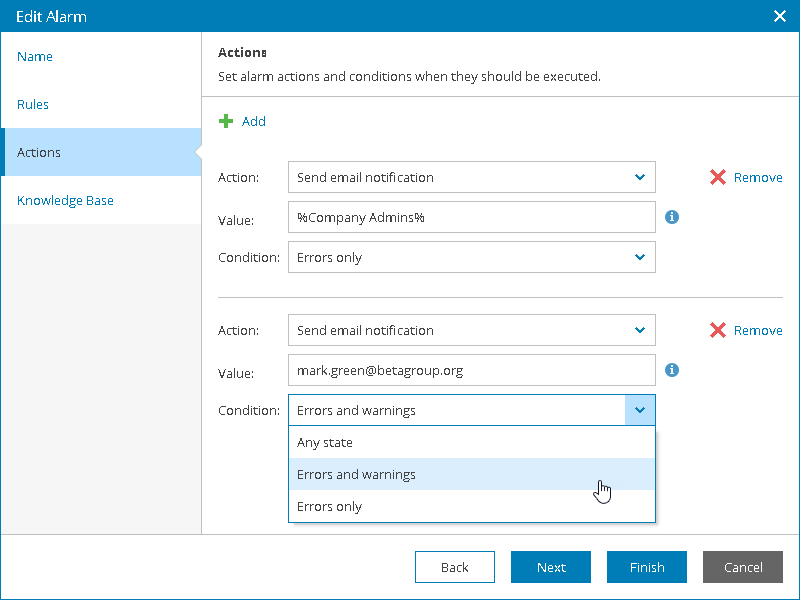 Errors and warnings — select this option if a notification must be sent every time when the alarm status changes to Error or Warning, or when a new alarm with one of these statuses is triggered. Errors only — select this option if a notification must be sent every time when the alarm status changes to Error, or when a new alarm with this status is triggered. You can add an alarm action that will run a custom script when a new alarm is triggered, or when the alarm status changes. This can be a BAT, CMD, EXE or PS1 script. By running a script, you can automate routine tasks that are normally performed when specific alarms fire. For example, if a critical system is affected, you may need to immediately open a ticket with the in-house support or perform actions that will eliminate the problem. In the Action field, choose Execute script. In the Value field, type a path to the script file. As a general rule, the script must reside on the machine for which the alarm was triggered. If an alarm targets the Company object, the script file can reside on managed Veeam backup agents or Veeam backup servers. When the alarm is triggered or when the alarm status changes, the script will run on all managed Veeam backup agents and Veeam backup servers of the company, provided that the script file is present on these machines. Note that the path to the script on all managed machines must be the same. If an alarm targets the Location object, the script file can reside on managed Veeam backup agents or Veeam backup servers. When the alarm is triggered for a specific location or when the alarm status changes, the script will run on all managed Veeam backup agents and Veeam backup servers that belong to the affected location, provided that the script file is present on these machines. Note that the path to the script on all managed machines must be the same. If an alarm targets a specific backup infrastructure component (Veeam backup agent, backup proxy, backup repository, WAN accelerator and so on), the script file must reside on the Veeam backup server that manages this component. On the service provider side, this can be the Veeam Cloud Connect server, or the machine where Veeam Availability Console is installed. If you used a distributed deployment scenario, place the script on the machine where the Veeam Availability Console Server component runs. Any state — select this option if the script must run every time when the alarm status changes to Error, Warning or Info, or when a new alarm with one of these statuses is triggered. Errors and warnings — select this option if the script must run every time when the alarm status changes to Error or Warning, or when a new alarm with one of these statuses is triggered. Errors only — select this option if the script must run every time when the alarm status changes to Error, or when a new alarm with this status is triggered. At the Knowledge Base step of the wizard, click Finish to save alarm settings.